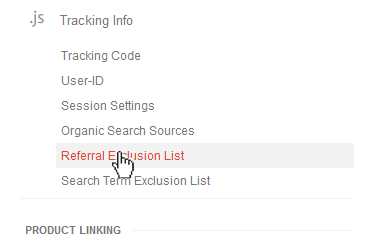 Do you referral stats in google Analytics looks like this? Semalt is a bot that will crawl your site for information about the page content and many other aspects of the website. If you haven’t signed up for the service like me then the bot is gathering information for competitive analysis. For me I have no problem with the bot or the business that semalt offer but its the fact is messes with my stats. As the bot will not follow the rules of robots.txt according to all the WOT reports here then your can try requesting removal from them directly via this link. 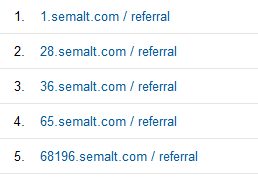 So you are using Google Analytics and want to remove Semalt.com from your stats? First log into your google Analytics account and click on the website property in question. Now you should see 3 columns. Columns Account, Property and View. The tracking info should now show in a drop down. Simply then add the domain to the exclusion list. You can do this with any domain you’d like. This will only working with ga.js or an analytics.js and not with doubleclick. If you don’t want the bot slowing down your site and also messing with your stats then .htaccess is your best option. What about Google Analytics views? If you need any help setting up View filters and any other type of Google Analytics setup then let us know. This entry was posted in Uncategorized on 08/28/2014 by Gabriel Homer.